Fits all GE room air cleaners that require a pre-filter. Makes 1 to 6 pre-filters depending on the model. Universal Cut-to-Fit activated carbon pre-filter, fits all GE room air cleaners that require a pre-filter. It helps remove large particles and reduce common household odors such as cooking odors, tobacco smoke odors, pet odors, musty odors, etc. 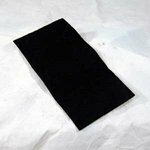 This is a large 15-3/4 x 48 cut-to-fit activated carbon sheet that makes 1 to 6 pre-filters depending on the model. For optimum performance, replace pre-filter every 2 to 3 months.